Every year, teams’ fortunes fluctuate because players get suspended. Now that major preseason suspensions to Brian Cushing, Ben Roethlisberger, and Santonio Holmes have expired, it’s time to compare the significance of suspensions issued during the 2010 NFL season. For a look at suspensions announced before the season began, check out this post. 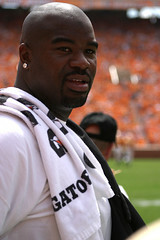 10 – DT Albert Haynesworth, Redskins (conduct detrimental to team) – Haynesworth famously signed a contract potentially worth $100 million before the 2009 season and cashed a $21 million bonus check before this season before clashing with head coach Mike Shanahan over playing in a 3-4 defense instead of his preferred 4-3. The situation festered throughout the season, with Haynesworth’s conditioning, commitment, and preparation constantly questioned as he played in eight of the first 12 games with just 2.5 sacks. In moments, like the Chicago game, Haynesworth was dominant, but he was largely an afterthought. Finally, the Redskins had enough and suspended Haynesworth for the last four games of the season. We don’t absolve Shanahan in this situation, but Haynesworth’s petulence certainly led to an embarrassing end to his Redskins season, both for him and the team. 9 – FS Tanard Jackson, Buccaneers (indefinite suspension no less than a year for violating league’s substance-abuse policy) – Jackson is a promising young safety, but substance-abuse problems have now sidelined him for the second straight season. (He was also suspended four games last season for a substance-abuse violation last year.) This time, Jackson faces an indefinite suspension and is not eligible to even apply for reinstatement for one full year. The Syracuse project entered the league as a fourth-round pick but emerged as a play-making free safety. He started all 16 games in each of his first two years and all 12 games after returning from suspension last year, and he notched eight interceptions, five forced fumbles, and 24 passes defensed in his first three years. It’s a big loss for a Bucs defense that doesn’t have a lot of eye-popping players on defense. Rookie Cody Grimm, a seventh-round pick, will fill in for Jackson, with vet Sabby Piscitelli in reserve. Neither guy has Jackson’s ability. For a Tampa Bay team with a lot of young talent, losing a young guy like Jackson who has proven he can play at the NFL level is a big blow. But Jackson apparently has bigger issues and demons to overcome. 8 – OLT Duane Brown, Texans (four games for violating league’s performance-enhancing substance policy) – Brown has started all 34 games in his career since joining the Texans as a first-round pick in 2008. While Brown isn’t a superstar left tackle, he does a solid job protecting Matt Schaub’s blind side. Losing such a key part of the offensive line for four games early in the season (after Week 2) is crucial. Rashad Butler, a former third-round pick of the Panthers, got his first career start in Brown’s place, and the Texans also brought back Ephriam Salaam for depth. But this loss, coupled with OLB Brian Cushing’s ongoing suspension for violating the same policy, is a big blow to a Texans team that has aspirations of a contender. 7 – DE Antwan Odom, Bengals (4 games for violating league’s performance-enhancing substance policy) – Odom was the Bengals’ best pass rusher last season, piling up eight sacks in five games before suffering a season-ending injury in game six. This year, he’s off to a slower start, with just four tackles in four games, which is part of the reason the Bengals have just seven sacks in five games. At his best, Odom adds edge rush to Cincinnati’s defense, drawing coverage that allows LBs Rey Maualuga and Keith Rivers more freedom to blitz and roam. Without Odom producing, the Bengals offense loses fright factor – to the point that a safety, Chris Crocker, leads the team in sacks through Week 5. Now Odom is sidelined for games 6-9 with a four-game suspension for violating the league’s performance-enhancing substance policy, further weakening a defense that isn’t the same this year as it was last season. Robert Geathers and Frostee Rucker must step up and provide pass rush now for the Bengals, or else the defense will have to blitz so much that it opens holes elsewhere. 6 – SS Steve Gregory, Chargers (4 games for violating league’s performance-enhancing substance policy) – Gregory, the Chargers’ starting strong safety, was flagged for violating the league’s performance-enhancing substance policy. It’s a big blow, because the fifth-year player has established himself as a solid starter at strong safety this year for a defense that’s playing well. Gregory isn’t a big playmaker, but his dependable presence brings stability. Former corner Paul Oliver will try to step in for Gregory for games 5-8 in San Diego. 5 – LB Brandon Spikes, Patriots (4 games for violating league’s performance-enhancing substance policy) – Spikes, a rookie out of Florida, was suspended for the final four games of the regular season for violating the league’s performance-enhancing substance policy. He opted not to appeal so that he could return for the playoffs. Over the first 12 games of the season, Spikes started eight games and had 61 tackles, three passes defensed, and one interception. He provided some physical play in the run game for a defense that needed some interior thump. 3 – DT Tony McDaniel, Dolphins (1 game for violating league’s personal-conduct policy) – McDaniel was benched by the league for Miami’s Week Four game against the Patriots following a domestic dispute with his girlfriend. McDaniel is a reserve defensive lineman, so his role is replacable, but missing a key division game is never a good thing, and the results against the Patriots were not good at all. 2 – P Pat McAfee, Colts (1 game team suspension for conduct detrimental to the team) – After a bizarre drunken escapade that ended in a cold canal at 5 a.m., McAfee got a one-game suspension from the Colts. Indy has shown that it comes down hard on such infractions, and so the Colts’ latest drunken idiot kicker will sit in Week 8. 1 – LB Leroy Hill, Seahawks (1 game for violating league’s personal-conduct policy) – Hill, once a starting linebacker and a franchise-tagged free agent in Seattle, has fallen out of favor because of both performance and off-field issues. He’s on injured reserve and out for the year, but he still drew his second one-game suspension (that went with a two game-check fine) from the league stemming from a series of off-field issues. This suspension stems from a domestic-violence charge; his first suspension this season resulted from a drug arrest. This baggage will likely write Hill’s ticket out of Seattle and could make it hard for him to find a team willing to give him a second chance. 1 (con’t) – OG Duke Robinson, Panthers (4 games for violating the league’s substance-abuse policy) – Robinson, a second-year guard out of Oklahoma, was on injured reserve when he was suspended for the final four games of the season for violating the league’s substance-abuse policy. Robinson has yet to play in his two-year career, and he has missed the entire season with a torn knee ligament this year. This injury is just another strike against a former fifth-round pick who has to be running out of chances in Carolina. We started this project with wide receivers in this post and then with tight ends in this post and quarterbacks in this post and running backs in this post and offensive linemen in this post. Now we move to kickers and punters, who wear numbers between 1 and 19, although the vast majority sport single numbers. 11 – PK Sebastian Janikowski, Raiders – The kicker also known as Sea Bass (think Dumb and Dumber) has a powerful leg and has the distinction of being one of the very few kickers to be a first-round pick in the NFL draft.